What is Cosmetic and Functional Rhinoplasty? A rhinoplasty, known more commonly as a “nose job,” is anything but a simple job. 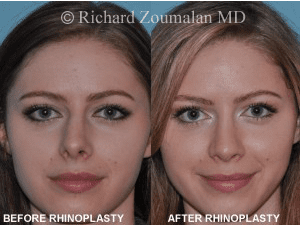 In fact, rhinoplasties are considered among the most difficult of all cosmetic surgeries, given the delicate nature of the nose and its prominence among facial features. Receiving a nose job in Beverly Hills is an excellent decision as it is the premier destination for nose surgery. Dr. Zoumalan is not only a highly regarded and board-certified surgeon, he is an acclaimed artist. A successful nose job in Beverly Hills requires a combination of hands-on surgical experience, artistry, and an understanding of a patient’s aesthetic and functional needs, but can completely transform a misshapen or damaged nose. For some, the boost in self-confidence is invaluable. For others, being able to breathe easy for the first time in years is invaluable. While the decision to undergo a rhinoplasty will always be a highly personal one, prospective patients should familiarize themselves with the two major types of procedures: cosmetic and functional, as well as the associated risks. 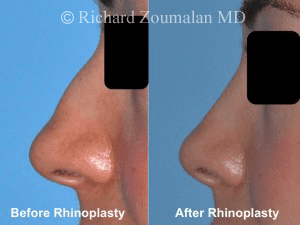 Many individuals, either through nature or nurture, may decide that their nose is not aesthetically optimal and decide to undergo a cosmetic rhinoplasty, which aims to alter the physical appearance of the nose without affecting functionality. Cosmetic rhinoplasties involve reshaping of the nasal cartilage and/or bone in order to enhance the nose and beautify the face as a whole. Different people will require different types of cosmetic rhinoplasties, and often a “dream nose” can be unrealistic, given a specific set of facial features. In other words, not everyone’s “perfect nose” will look the same. A functional rhinoplasty seeks to improve the shape of the nose in order to reduce airway obstructions. Often, an individual suffering from an airway obstruction may not realize it for what it is – common signs can include nasal congestion, mouth breathing, dry mouth, or a reduced sense of smell. Nosebleed, sinus problems, sleep apnea, and insomnia are all possible symptoms of a physically obstructed airway that could be repaired through functional rhinoplasty. If you believe you may be suffering from airway obstruction, you should consult your doctor and ask if a functional rhinoplasty is right for you. Often, individuals in need of functional rhinoplasty will often desire aesthetic reshaping, so many functional rhinoplasties are also cosmetic. A combined nose surgery is a very challenging procedure. The best way to achieve desired results is to be open with your surgeon about how you want your nose to look, while understanding the limitations of rhinoplasty (based on your natural bone structure), as well as its associated risks. All surgeries carry risk. Depending on your natural immunity, rhinoplasties can lead to infection, chronic swelling, and sinus problems. But the greatest risk involved with any nose surgery is psychological. Many individuals with already-attractive noses may have skewed perceptions of their relative attractiveness, and become disappointed by rhinoplasties that produce less-than-incredible results. Others may desire noses that might not actually compliment their personal facial features. Still others may expect functional rhinoplasties to also be cosmetically ideal. Dr. Zoumalan will walk you through receiving a nose job in Beverly Hills, and what your expectations are. Prior to going forward with anything, he will ensure that you will be receiving exactly what you hope for. If he believes he cannot make you happy he will be completely honest about the expectations.